Danzig’s first album of new material in 7 years – the less said about 2015’s covers album Skeletons the better – Black Laden Crown finds Danzig rolling back the years to when his brand of simple, earth-shaking, blues-metal first made the world sit up and take notice of this Elvis meets Jim Morrison clone. 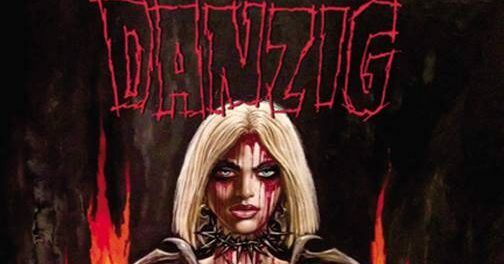 Fans will be relieved to hear that Danzig is back to doing what he does best; mixing blues rock with doom metal and traditional metal tropes to create something decidedly evil and deliciously decadent. Most importantly, Black Laden Crown is also the finest Danzig album since Danzig I-IV heralded the arrival of this diminutive demon. However, while Danzig’s holler is as unmistakable as ever, Black Laden Crown success lies at the hands of Tommy Victor (Prong) and his crushing riffs. His cavalcade of feedback drenched, heavy metal thunder makes Black Laden Crown a heavy, heavy album indeed and the Sabbath sized main riff on “But A Nightmare” is an absolute monster, a colossal track that builds and builds in intensity and recalls the material found on Danzig’s classic debut.